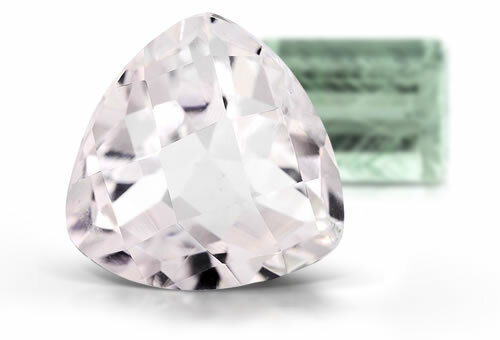 Spodumene is the name of a mineral species that includes two very special gems varieties: kunzite and hiddenite. Spodumene is named from the Greek spodoumenos, meaning "burnt to ash," which alludes to the ashy color of many specimens. A member of the pyroxene group, spodumene belongs to a class of minerals called silicates and it is one of a small number of minerals that contain lithium. Spodumene also occurs in many other shades of colors, all pale but very clear and brilliant. These varieties are given color descriptor names; for example, lemon spodumene. Spodumene is a type I clarity stone. Stones might contain growth and etch tubes, healing cracks, liquid and multi-phase inclusions.